Dutch elm disease is noted for its severity because it destroys American elm and severely damages other elm varieties. The disease is caused by a fungus (Ophiostoma ulmi) that is spread mainly from one tree to another by two insect species, the native elm bark beetle (Hylurgopinus rufipes) and the smaller European elm bark beetle (Scolytus multistriatus). These two species breed in dead elm wood such as broken branches in an elm tree canopy or cut logs from pruning or salvage operations. The new brood of bark beetle adults produced in a diseased elm acquires sticky fungal spores on their body surfaces. These beetles then fly to feed on healthy elm trees. 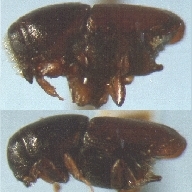 In burrowing to feed under the bark, the fungal spores are easily rubbed off the beetle's body. Spore germination then leads to the fungus spreading and plugging the tree's water conducting elements, causing infected branches to wilt and die. Eventually the tree dies completely, usually within one or two seasons. Presently, Dutch elm disease ranges throughout most of the United States and Canada where native and ornamental elms are found. It was first identified in Ohio in 1930. By 1944 it had reached Quebec and spread to Ontario by 1946. In 1975 it had reached Manitoba and by 1981 it appeared in Saskatchewan. Alberta still represents one of the last outposts of uninfected elms in North America.